Summer has been over and Fall is really here, temperatures are beginning to drop, and you’re dreading having to turn the heat on for the first time. Firing up the furnace can burn a hole in your pocket, but there’s something you can do about it. 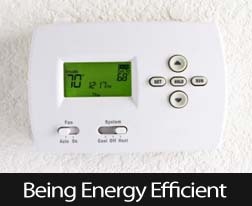 Consider these tips to help lower your heating bill. Get new air filters for your central heating and cooling. The filters get clogged and it takes more and more energy to keep your house warm. Be sure to clear out any dust bunnies or cobwebs from behind the filter. Use a vacuum if necessary. Heat rises, and if your attic is not adequately insulated, then your central heating system will be stuck sending all your hot air (and your heating bill) straight through the roof. There are three options for attic insulation: roll on insulation, spray on insulation, or polyurethane foam. Roll on insulation is the best option for the do-it-yourselfers out there, but you might consider using polyurethane foam if you plan to turn that attic space into a bedroom. Cold air is constantly sneaking into your house through the cracks in your window. Use a temporary silicone caulk to seal up your windows during the winter. When you’re ready to open them up again in the spring, the silicone caulk will crack right off without damaging the paint. Wrapping your pipes will insulate them from the cold to prevent freezing, as well as saving you money on energy bills. Use a special insulation sleeve from the hardware store or do it the old fashioned way with heat tape. This is especially important if you have pipes in an crawlspace or basement that isn’t insulated. You don’t have to buy special panels to take advantage of solar power. Open the curtains on south-facing windows, and heat up your house the natural way. With the sun’s help, you won’t need to bump your thermostat up as often. Don’t be afraid to turn your thermostat down a little bit. If you’re leaving the house for a while, bump it down a few degrees and give your system a rest. Try throwing an extra blanket on the bed and dropping a few degrees before bed. You’ll only see a difference on your bill. You might try a programmable thermostat as well! Now that it’s getting cold, you can finally make some hot chocolate and put on your brand new coat, but you shouldn’t have to wear it inside. With these easy tips you can learn to keep your house warm without having to crank up the thermostat.